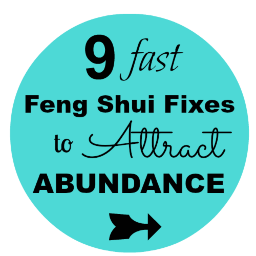 Blog with Feng Shui tips for shifting energy and improving your life. I recently heard Doreen Virtue say that no one, not even the well known spiritual teachers (including herself) has all their stuff together. Everyone has life issues they are working on. I know I do and I’m willing to bet you do too! 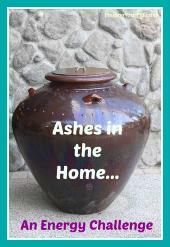 Many people keep the ashes of their loved ones in their homes and often they are placing them in a location within the home that is energetically harming them. The energy of non-living things (not only ashes, but also dried flowers and other “dead” items) can create many difficulties — everything from lost opportunities and income to health and relationship challenges. It’s back to school time which is an adjustment for kids from the carefree days of summer to new classes, homework and sometimes even a new school and new friends. 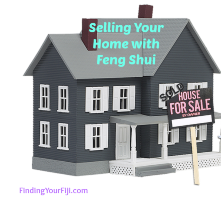 It’s a great time to take a look at your home with a Feng Shui eye to insure a successful year for your students. 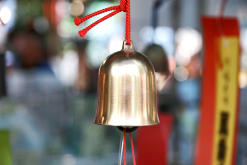 Bells are commonly used in Feng Shui for adjustments and for attracting energy and opportunities. Bells are used in many religious and spiritual practices as well. Bells even symbolize holidays such as Christmas or the winter season (think sleigh bells). There's something magical about the sound of bells that makes you stop and listen. The sound of church bells ringing or a doorbell certainly gets your attention. Feeling Stuck? 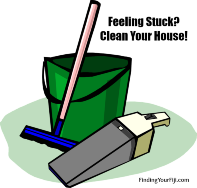 Clean Your House! I have a confession. A few weeks ago my house was really dirty. I mean, like you could write your name in the dust on my dresser dirty. And the sand in my back entry hall filled a dust pan! Those of you who live in winter wonderlands know what I’m talking about, right? Somehow the sand they spread on the roads to keep cars from slipping just appears in the house, like magic, except not as much fun. Clutter is not Feng Shui’s friend. 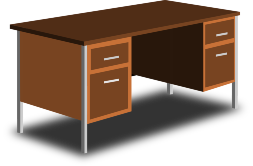 I’ve written about this topic before in Do You Need a Clutter Buster? and Clearing Clutter in Disguise. There are great and useful tips in those blogs. So why am I bringing it up again? 1. Because despite my best efforts, I still had some clutter and I know you do too. What if your space is pretty clear of clutter and you’re still not attracting the things you most want into your life? 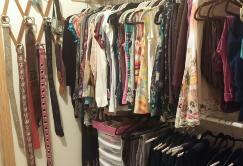 Then it’s time to address clutter that’s disguised as something else. Perhaps it’s a keepsake, like your children’s art. Or maybe it’s something you paid a lot of money for and never used. 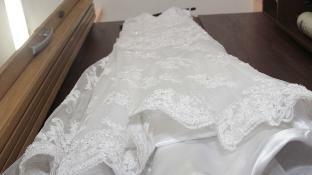 You don’t want to donate it and yet can’t find anyone who wants to buy it. Do You Need a Clutter Buster? If you want more money, you do! The quickest way to manifest more money is to clear out clutter. 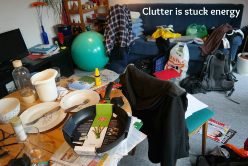 Clutter busting helps with a number of other life issues as well! In Feng Shui, doors represent the voice of adults in the home (windows are the voice of children – see more tips for children in Back to School Feng Shui Tips). 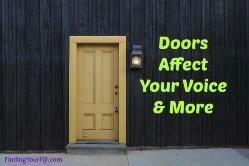 Your doors may be having a bigger effect on your life than you know. Indoor plumbing is a great convenience. I shudder to think what it would be like to use an outhouse during one of our freezing Minnesota winters! 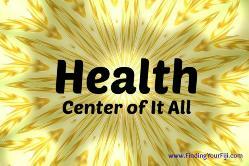 The center area of the Feng Shui Bagua represents Health. 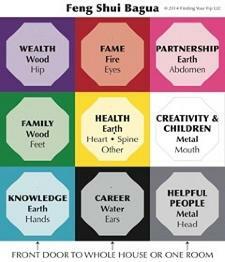 It touches all other areas of the Bagua, just as the state of your health affects every area of your life, right? Your health affects your creativity, your children, your relationships, your reputation, your finances, your family, your ability to learn, to travel and most definitely affects your career. Holidays are a time of joy, of stress, of fun activities, parties and obligations. Sail through this year's holiday with ease and grace. #1) Hang a bell on your front door to attract good energy and opportunities and gain clarity about your career. You can leave the bell there all year long if you like. Bells also help you (and others) make decisions. 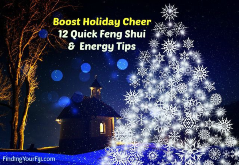 See my Bells Brrrring Good Things blog for more information on the magic of bells in Feng Shui adjustments. 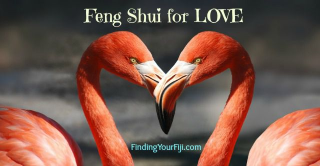 Whether you are in a relationship or still searching for your soul mate, Feng Shui paves the way for more harmony in your relationships. There are many factors that affect the speed with which your home sells. As I write this blog, it is very much a “Seller’s Market” and realtors say there is not enough inventory of homes to meet the needs of all the buyers. And yet, some homes take longer to sell than others. Why is that? Homes have an energy to them, just like people and objects do. Prospective buyers can feel the energy of your home. Take my house, for instance. It has great energy. People love to hang out there. I enjoy hanging out there myself! But, as many of you know, I am moving to Maui. So my house needs to be sold. Shut the Front Door - or Open It!! 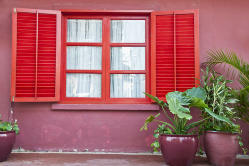 When you hear someone talk about Feng Shui, an image of a front door painted red may come to mind. 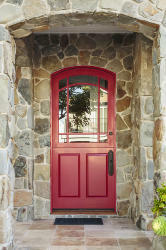 In Feng Shui, we refer to the front door as the “mouth of chi.” This is where the energy and opportunities enter your home and, in effect, your life. Can you see your front door from the street? Or is it blocked by overgrown bushes or trees? Perhaps your front door is actually on the side of the house. How is the energy and opportunities going to find you?! Is the pathway from the street to your front door welcoming? What about your front door itself? 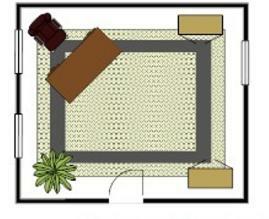 Does it blend in with the rest of the house? Stairs and steps are necessary for moving from one level to another. Yet stairs can impact your life depending on where they are located, the type of steps and risers that are used and what they face. 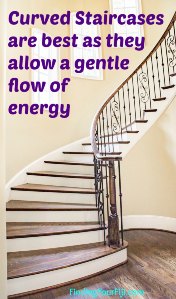 Stairs are heavy and can bring down the energy in those areas of your home. 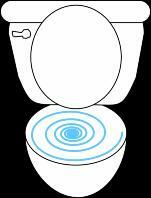 Steps can also cause “up and down” energy in the area of the Bagua where they are located. For example, a staircase in the center of your home (which relates to health in the Feng Shui Bagua) can have an up and down effect impacting your health so sometimes it’s good and sometimes it is not so good.